Due to scheduling during Road Trip, Café Court will be adjusting dinner hours on Saturday, February 20. The dinner hours that evening will run from 5:00-7:00 p.m. Thank you for your support. The University of Evansville will host a visit February 29 - March 2, with a five-person review team representing its regional accrediting agency, the Higher Learning Commission (HLC). Come watch Nerd Wars tonight! Come and watch Evansville's nerdiest event of the year! Nerd Wars begins in Eykamp Hall tonight at 7:00 p.m. and is free to spectators. Come see UE's smartest students don their pocket protectors and match wits with their professors! Let the trivia begin! This evening's recital will feature Oramay Cluthe Eades Distinguished Professor of Music and Violin Carol Dallinger in a program of works from the Baroque to the Modern era. Dallinger will be joined by various Department of Music faculty members and local musicians throughout the program. The concert will open with a performance of Handel’s Violin Sonata in D Minor, HWV 364a, with adjunct instructor of harpsichord Helen Skuggedal Reed and adjunct instructor of cello Jennifer Wingert providing the basso continuo accompaniment. Consortium instructor of flute Cara Dailey will then join Dallinger for a performance of César Cui’s Five Small Duets for Flute and Piano, Op. 56, with professor of piano Anne Hastings Fiedler accompanying the duo. Fiedler will then accompany Dallinger in performances of Amy Marcy Beach’s Romance for Violin and Piano, Op. 23, and Harry Mathena Gilbert’s Marionettes. For the final work, Eykamp String Quartet violinists Robert Anemone and Alicia Choi and EPO violinist Kathryn Savia will join Dallinger for a performance of twentieth-century Polish composer Grayna Bacewicz’s Quartet for Four Violins. The recital will take place in Wheeler Concert Hall at 7:30 p.m. and is free and open to the public. Looking for simple new ways to come closer to your faith this Lenten season? Join Newman Club members Nathan Kabat and Nicolette Fonseca for 20 minutes every Friday at 11:00 a.m. in Neu Chapel as they lead us in the rosary! We hope to see you there! In conjunction with Founders Day, the University will celebrate its Methodist-related history by hosting a United Methodist Festival of Hymns today at 7:00 p.m. in Neu Chapel. The ecumenical festival is designed to encourage and inspire congregational singing, with choirs, clergy and musicians from the local area and the campus community leading the collaborative effort. The event will feature some of the great hymns sung with brass, wind, and keyboard instruments, including the harpsichord, pipe organ, and piano. 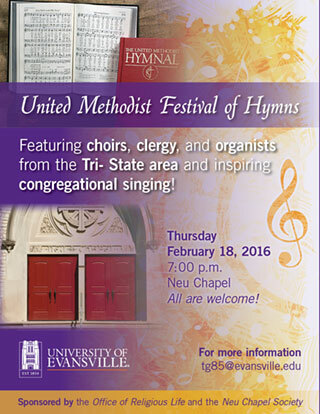 The Evansville community is invited to the Hymn Festival on February 18, and the Founders Day ceremony on February 21. The Black Student Union would like to welcome you to come out and join our very own students as they dance, sing, and perform some of their favorite pieces from those who have influenced African American art. The event will be held in Eykamp Hall, Room 251, Ridgway University Center, tonight from 7:00-8:30 p.m. The orientation of new members of NSLS is set for today from 8:00-9:00 p.m. in Room 172, Schroeder School of Business Building. Those unable to attend should e-mail Jennifer Allen at ja225@ueliveevansville.onmicrosoft.com to set up a time to go through the orientation video. Remember all members must attend orientation as part of their requirements to be officially inducted in April. The rebroadcast of the Speaker 1 Broadcast is set for today from 7:00-8:00 p.m. in Eykamp Hall, Room 253, Ridgway University Center. Those unable to attend should e-mail Jennifer Allen at ja225@ueliveevansville.onmicrosoft.com to get an email invitation for the link. Remember all members must attend three speaker broadcasts as part of their requirements to be officially inducted in April. The 2016 RecycleMania tournament is under way! The competition, which encourages waste reduction and recycling on campuses nationwide, ends April 2. UE is one of many schools participating this year. UE will compete in several weight-based categories that measure recycling and waste reduction per capita, as well as overall campus recycling weights as a percentage of total waste generated. RecycleMania is about more than simply winning. It is a time to engage the entire campus community in awareness and action to reduce waste, recycle more, and protect the environment. More information can be found at www.recyclemania.org. So let’s all recycle! Check upcoming AceNotes and UE’s Environmental Management Facebook page for more information. If any of our recycle bins are full, or if you have questions, call ext. 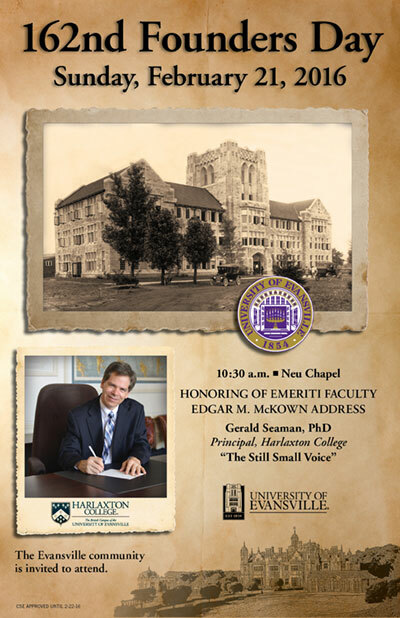 2697 or e-mail js652@evansville.edu. It's time for I-House again! This week, Amina from Morocco will be presenting. Her major is engineering management, and she loves photography. Her favorite part about UE is being with her roommate! To learn more about Amina and her life back home, come upstairs in Ridgway University Center, tonight at 7:00 p.m.! How do you build an argument? Learn an approach for coming up with ideas, relating them to the thesis, and organizing them logically. Join us today at 5:00 p.m. in the Writing Center for this useful session. Don't wait until it is too late to register for Career Expo. Signing up gives you access to 130 employers together at one free event. Don't worry about how you'll get there, because UE will provide bus transportation. A $10 required deposit is refundable upon attendance. Reserve your seat now (www.evansville.edu/careercenter/busReservationForm.cfm). Beginning Wednesday, February 18, the Newman Club will be participating at the 5:30 p.m. Wednesday Masses at St. Benedict Cathedral rather than holding its regular 9:30 p.m. Wednesday night Masses. They will meet each Wednesday at 5:20 p.m. in the back of the Cathedral. A final major administrative change was the addition of several positions at the vice presidential level, although in some cases the change involved name rather than function. Thus the title of the chief academic officer (Nicholas C. Brown), previously dean of Evansville College, became vice president for academic affairs. The third floor of the library is officially open! Books with call numbers starting B 1264 - H can be found here. Some books have been temporarily shelved on the fourth floor. Their call numbers are A through B 1253 1963. If you need help finding a book, please ask at the Information Desk. Please remember that the third floor is a dedicated silent space. A Pandora bracelet was lost last night (Monday, February 15) in Shanklin Theatre. It has a lot of sentimental value. If found, please e-mail mp214@evansville.edu. 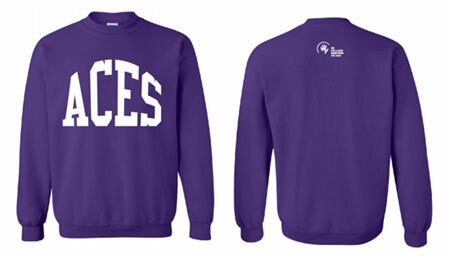 College Mentors for Kids is once again selling crew neck sweatshirts as a fundraiser for our organization! College Mentors for Kids is a non-profit national organization that connects college students with the most to give to kids who need it the most. We want school kids to look forward sooner and be able to give back later. Sweatshirts are $20, and they can be ordered by visiting Ridgway University Center on Wednesday from 11:00 a.m. - 1:00 p.m. or by e-mailing Taylor Wornica (tw151@evansville.edu). See the image below for the design. Orders will be taken until Monday, February 22. Please help our organization continue to impact the lives of young students in the Evansville area! Mandatory Road Trip host meetings this week! If you have any questions, please contact Ashley Ross (aj53@evansville.edu) or Jonathan Kelly (jk115@evansville.edu). Volunteers are needed to help with the Girls IN Bloom Expo planned for April 2 on campus. Girls IN Bloom is a non-profit organization, and this is its 14th annual expo. The expo provides girls with fun, educational workshops and activities that strive to build positive self-esteem through creative expression, diversity, social and cultural issues, and community involvement. Need to be available April 2 from 8:30 a.m. to 1:00 p.m. Contact Linda Wicker at lw74@evansville.edu for more information or 812-488-1094. The University of Evansville, in pursuit of excellence in service, wishes to recognize a non-faculty employee displaying records of achievement as a leader. Leadership may be demonstrated in any of the following areas: service to the University, service to students, job performance, and attitude toward fellow employees. To be eligible, an employee must be a full-time member of administration or staff. Nominations for the March 2016 Employee of the Month are due no later than Wednesday, February 17. To nominate someone, please go to: acelink.evansville.edu/tools/employeeaward. Assistant professor of philosophy Lisa Kretz will attend the International Association of Professional and Practical Ethics Annual Conference this week to share research findings from a collaborative research study completed with assistant professor of education Matthew Knoester. Anthony Beavers (professor of philosophy and director of the Cognitive Science Modeling Lab) and Justin Slattery (senior major in philosophy, creative writing, and English) completed their chapter, "On the Moral Implications and Restrictions Surrounding Affective Computing," for inclusion in Affective Sciences in Human Factors and Human-Computer Interaction, edited by Myounghoon Jeon and to be published by Elsevier. Abstract: Building simulated affects into artifacts poses a moral dilemma. On the one hand, in order for humans to interact fully with machines, the machines need to meet them on human terms, and this requires machines that are capable of assessing human affective states and responding to them in kind. On the other hand, doing so amounts to a fundamental deception that humans will find it hard to keep in mind, namely that these machines do not actually have these affective states and may not, therefore, be worthy of our attachment and our moral regard. Yet, simulated affects, we argue, are necessary for creating machines that can make moral decisions, that affects are essential for disambiguating the utterances of machines and humans, and that not all forms of deception are bad. After an initial provocation, these arguments are taken up in order, after which we argue further that while simulated affects are necessary, they could nonetheless lead to abuse. Therefore, the standard ethical limits and principles involved with any technological innovation must be respected. The Office of Development and Alumni Relations would like to congratulate Scott Gilreath on his recent promotion to the position of Director of Development. Scott joined the University of Evansville’s Development team in 2010 and has since served as the director of annual and corporate giving. Over the course of the last year, he has also served as the project director for fundraising for the Physician Assistant Program. In Scott’s new role, he will oversee corporate, annual, and major giving. Congratulations, Scott! Camille Coleman enjoyed a career showing against Southern Illinois on Sunday, as it took just 19 minutes for the freshman to establish a new career high, and on Monday, her efforts were rewarded as she was named Newcomer of the Week by the Missouri Valley Conference. Coleman, who finished the day with 26 points on 10-of-17 shooting, racked up 20 in the game’s opening half. Her presence was felt most beyond the arc as she went 5-for-6 from distance in the narrow loss to the Salukis. A native of South Bend, Indiana, Coleman has started to catch fire in recent weeks, registering double-digit points in three consecutive contests. She’s averaging eight points for the season, and Sunday marked her best output since a 19-point outing at Bowling Green in December. Coleman and the Aces will return to action this weekend at the Ford Center, taking on Wichita State on Friday and Missouri State on Sunday. University of Evansville junior Danielle Freeman batted .571 while helping the Purple Aces go 4-1 in the Trojan Invite. For her efforts she was named the Missouri Valley Conference Player of the Week. "Danielle had a tremendous opening weekend at the plate,” Aces head coach Mat Mundell said. "She has been working hard all off season. We are happy to see if paying off for her." In the first weekend of the season, Freeman showed just why she is one of the top offensive players in the MVC as she batted .571 leading Evansville to a 4-1 mark. Freeman opened the year going 1-2 while drawing two walks versus Eastern Michigan. She followed with her top game of the weekend, going 3-4 with 4 RBIs and three runs scored against Alabama State as she hit her first home run of the season. Freeman recorded another 2-hit outing at Troy while posting one hit in the other two games. She notched four doubles on the weekend while walking three times. Next weekend, UE heads to the Tennessee State Tiger Classic where they will face Tennessee State, East Tennessee State, Louisiana-Monroe, Butler, and Northern Kentucky. Faculty and staff may pick up their complimentary tickets for this weekend's men's and women's basketball games. The women's basketball team will face off against Wichita State at 7:00 p.m. on Friday and against Missouri State at 1:00 p.m. on Sunday. The men's basketball team will face off against Southern Illinois at 3:00 p.m. on Saturday. 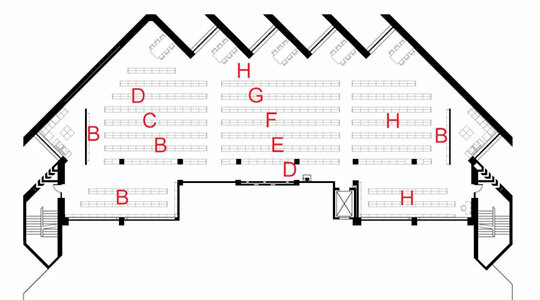 All faculty and staff must present a valid UE ID when they pick up their tickets. Please visit Carson Center Ticket Office or call ext. 2237 for more information.